Maine’s continuing hospital debt dispute demonstrates the often befuddling, contradictory political process of creating legislation. But the latest twist might just provide the political cover Gov. 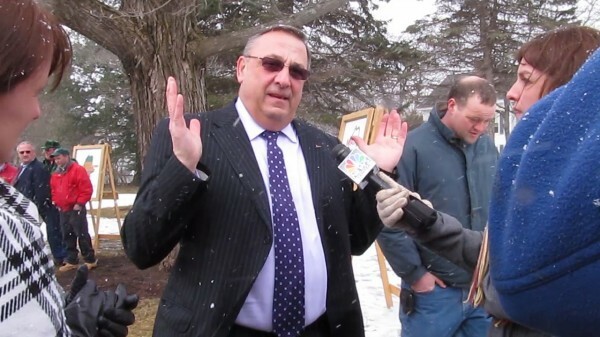 Paul LePage needs to allow Medicaid expansion to go forward. Think of what could have been accomplished if it had been politically possible for Democratic and Republican lawmakers to meet with LePage months ago and negotiate a plan to repay the hospital debt, issue a new liquor contract and expand Medicaid. It may have looked like what the Democrats are now proposing: Pay the hospitals the debt they are owed by issuing revenue bonds backed by the state’s future liquor revenue (LePage’s idea) and agree to expand Medicaid under the Affordable Care Act (mostly supported publicly by Democrats). Yet the resistance has been fierce. LePage called the Democrats ’ proposal an “ultimatum,” “a sin” and “criminal.” House Minority Leader Ken Fredette, R-Newport, called it an “irresponsible, last-minute stunt.” The House Republican Office issued a press release detailing times in the last two months when Democratic legislators complained about tying one legislative initiative to another. Political irony abounds. Democrats initially resisted tying together the liquor contract and hospital payback plan — until they put together a plan to do just that. Their proposal at first, though, required a large upfront payment from the winning liquor vendor to pay the hospitals rather than a revenue bond. Now — after an independent analysis revealed the upfront payment would cost the state more in the long term — Democratic leaders are putting together a new bill. It would have revenue bonds pay off the hospital debt, just as LePage wants, and require the state to expand Medicaid access by raising income eligibility limits, just as a majority of polled Maine residents want. Meanwhile, Republicans encountered their own political irony. Fredette on Monday issued a statement to say the hospital payback plan “deserves a clean, up-or-down vote,” even though the plan has never been solely about paying off the hospital debt. LePage has also tied in voter-approved bonds, saying he will not release them until the Legislature approves a hospital-repayment plan. The state’s hospitals are owed $484 million, dating back to 2009, because they provided services to Medicaid patients but were not reimbursed. Ideally, LePage and other Republicans would agree to Medicaid expansion based on its own merits: providing all Maine residents access to health care. Analyses have shown Maine is likely to get a good deal in terms of federal funding, especially in comparison to other states. But if LePage has so far not agreed to expand Medicaid, what would have to change for him to do so? The Democrats may have finally hit the political sore spot: Will LePage veto a bill that does exactly what he has been requesting for months — pay back the hospitals — if it includes Medicaid expansion? The politics may have been convoluted until this point, but the intention is clear: The odds are greater that he’ll approve an omnibus bill that includes the hospital payback plan than a bill that only addresses Medicaid expansion. The Democrats’ bill may give LePage the opportunity to expand Medicaid and simultaneously appease his base. He can say Democrats forced the issue, and he took the high road to pay the hospitals. Or, he could finally come around to Medicaid expansion, as other Republican governors have done, and recognize that he would be supporting the hospitals by expanding Medicaid. After all, the Maine Hospital Association, which represents the state’s 39 hospitals, supports both getting the money they are owed and expanding coverage for Maine’s low-income residents. Members of each party face their own political ironies. The ultimate question is whether the GOP will be willing to bend as Democrats have, acknowledge their contradictions, and move on. In the end, the policy, not the politics, will have the longest-lasting impact on Maine people.